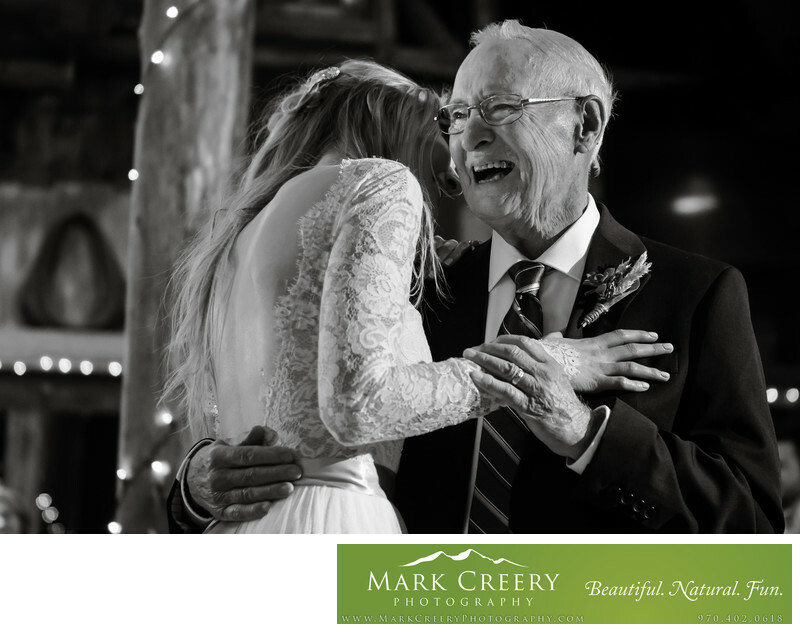 In this touching photo of the bride dancing with her father at her wedding reception, the father is overcome with joy. It was a brief moment that I was ready to capture, as I'm always looking for the next moment that could happen at any time. He was composed for most of the dance, but really lit up when the bride told him something funny. These are the kinds of memories that I provide for couples, that they can look back on when their parents are no longer with them. The bride and groom's wedding day was a blast, and the couldn't have been happier with their venue choice. Devil's Thumb Ranch has a rustic western charm. Located near Winter Park, it has everything you could ask of a Colorado wedding venue. The name comes from the Native Americans, who named the rocks behind the ranch after a battle. The homestead was originally built in 1937 and has lots of cabins for guests to stay in. There are several reception venues to choose from to fit your wedding needs perfectly - High Lonesome Barn, Broad Axe Barn and Timber House. Devil's Thumb Ranch is located in Tabernash, Colorado. Contact: (970) 726-7002, ext. 724. Location: 3530 County Rd 83, Tabernash, CO 80478.